Photography: A diversified present and a multi-dimensional future…! When Sir John Herschel in a lecture before the Royal Society of London, on March 14, 1839 who made the word “photography” known to the world. Little did he realise that ‘Photography’ would be amongst the greatest inventions of mankind coming a long way with innovation and continuous transformation of engineering marvel and excellence in image making with precision and belief. When we look back to the long exiting journey this medium has overcome. The combination of Art and Science has indeed travelled a long way, maturing skills and techniques worldwide. Over the years the photographic form has undergone immense transformation in terms of content and has been customised with the changing needs and demands. Photographic equipments have changed shape and type over the period of time, and is still in the process of refinement. Even long before the first photographs were made, Chinese philosopher Mo Di and Greek mathematicians Aristotle and Euclid described a pinhole camera in the 5th and 4th centuries BC. The oldest heliographic engraving known in the world. It is a reproduction of a 17th century Flemish engraving, showing a man leading a horse. It was made by the French inventor Nicéphore Niépce in 1825, with an heliography technical process. The Bibliothèque nationale de France bought it 450,000 € in 2002, deeming it as a “national treasure”. Not musing much on the history and development of photography, I wish to persevere with this discussion to the present and future of this wonderful, glamorous and the visual recorder of time, getting into the Digital world of photography and the collaboration of with the e-world of networking. There after making the not so obscure space using technology and connecting to the virtual learning environment to harness and develop the artistic imagery of photography beyond the conventional mode of a walled classroom. The 20th century witnessed the acceptance of Photography as an Art form primarily advocated by Alfred Stieglitz, Edward Steichen, John Szarkowski, F. Holland Day, and Edward Weston, which was also followed by the movement ‘Pictorialism’. Thus leaving behind a pictorial heritage with the amazing work of the likes of Ansel Adams, Brassai, Alfred Stieglitz, Henri Cartier-Bresson, Raghu Rai and several other pioneering photo artists, trend setters in their own arena. During the 1880 photographers experimented with the replacement of the different silver emulsion. Thus emerged the era of Sepia toning, a specialized treatment that gave the black and white photograph a warmer tone and enhanced its archival qualities. Chemicals were used to convert the metallic silver in the print to a sulphide compound. Most archival Vintage prints in Museums that we often come across even today in the Museum and palaces worldwide are attributed to this method of archival process involving Selenium toning, to bring a much more resistant image to the effects of environmental pollutants such as atmospheric sulphur compounds. At the turn of the 20th century Photographic manufacturers developed emulsion of different tones as ‘ Chloro bromide’ a paper with an emulsion composed of silver bromide and silver chloride; used in photography for fast-speed contact paper, and medium-speed enlarging paper. Agfa Portriga Rapid and Agfa Record Rapid (the highest Silver content Black and White Photographic Paper made for the Mass Market) had a brownish green tone. However the earlier work on Photography involved an equally understanding of the post production universally referred to, as the ‘darkroom’ techniques. Great photographs were often created in these low lit areas of the photography studio, ‘the darkroom’. Predominantly the earlier work was primarily confined to the black and white images and continued to be a favourite amongst most photographers even after the advent of colour photography created for the market in 1935 when American Kodak introduced the first modern “integral tri-pack” colour film and called it Kodachrome, a name recycled from an earlier and completely different two-colour process, prior to several experiments and unsuccessful presentations. However with the development in worldwide marketing strategies, the analogue method of Photography slowly began to move into oblivion by the end of the 20th century. Kodak ventured with their the first recorded attempt at building a digital camera was in 1975 by Steven Sasson, an engineer at Eastman Kodak using the CCD image sensor chips developed by Fairchild Semiconductor in 1973. The first true digital camera that recorded images as a computerized file was likely the Fuji DS-1P of 1988, which recorded to a 16 MB internal memory card that used a battery to keep the data in memory. This camera was never marketed in the United States, and has not been confirmed to have shipped even in Japan. Over the next decade, DSLRs have been released by various companies, including Canon, Nikon, Kodak, Pentax, Olympus, Panasonic, Samsung, Minolta (later Konica Minolta, and whose camera assets were then acquired by Sony), Fujifilm, and Sigma, with higher resolutions and lower prices. In January 2000, Fujifilm announced the FinePix S1 Pro, the first DSLR marketed to non-professionals. In November 2001, Canon released its 4.1 megapixel EOS-1D, the brand’s first professional digital body. In 2003, Canon introduced the 6.3 megapixel EOS 300D SLR camera (known in the United States as the Digital Rebel and in Japan as the Kiss Digital) with an MSRP of US$999, directed at the consumer market. Its popularity encouraged other manufacturers to produce affordable digital SLR cameras, lowering entry costs and allowing more amateur photographers to purchase DSLRs. Today the Photography world is out of the darkroom and into the megapixel arena. However not much of the concept of megapixel is yet understood in the amateur as in the professional world. Misconception towards understanding the effect of higher megapixel on actual photography is yet to be understood. The ruling myth that higher the megapixel, better is the image quality is not actually true. Looking back at the 110 format of film cameras that were very popular in the late 1980’s with the revolution in the photography world making the camera a household necessity and conveniently priced with the HOTSHOT brands and the Piccolo colour films. The limitation in making enlargements from a 110mm film shot very often was associated with grains. The results compared to larger film formats those days are similar to the quality of the digital image determined by the image sensor. Modern Digital Single-lens Reflex camera or the DSLR cameras produce better images because they have larger sensors. Larger the sensor, the costlier the equipment is. When it comes to comparing digital cameras we need to look carefully at the size of the image sensor. It indicates that you need to look at both image sensor size and the number of megapixels in order to choose the best camera to suit your needs. You will be better off with a larger image sensor and less megapixels than more megapixels and a smaller sensor. As compared to the 35 mm film format which is termed as “Full Frame” basically means that the image sensor is the same size as 35mm negative, with the size of 36 X24 mm~ 864mm2, the Canon APS-H has the largest image sensor at 28.7 X19 mm ~548mm2 the APS-C in Nikon, Canon and most other DSLR has the size 23.6 X 15.7 mm ~ 370mm2. The size of the image sensor becomes very important if you will be enlarging your photos at all or if you will need to crop them. A 10 megapixel camera with a small image sensor is as good as a 5 megapixel camera with a larger image sensor. The grandeur of the analogue imaging world suddenly started to vanish with the markets being flooded with the variety of Mega pixel made available in open markets worldwide by the giants of photographic equipments Nikon, Canon, Minolta Olympus and others. The Japanese giants however retained their innovation and excellence in the Digital world of imaging. The 21 st century literally witnessed the rapid progress in taking over by the Digital invasion. Shooting on film slowly disappeared and films of different make vanished from the stores. The variety of films that used to be available till about a decade slowly became a part of the celluloid history. Shooting on the celluloid however still remained the ultimate choice in the film industry. The analogue laboratories that had sprung up in every major city in the country winded up and resorted to other viable trade. I often remember those days when visiting a Book Fair were primarily to browse the ever attractive photography collector publications. Works like that of Raghu Rai’s ‘Taj Mahal’ series, and the How to Shoot Macro, Landscapes and Portraits, and the Kodak publications at Standard Literature Stores. The publications in jazzy outlook and printed on glossy art paper were more of a desire to own and a moment to experience to reckon. Over the years books were fast being taken over by the digital and electronic media. The convenience of your living room and a National Geography or Discovery channel on air, you experience the latest happenings in the world of Photography apart from the usual program. These channels showcase the best in the world of Photography and inspire aspiring photography enthusiast to rediscover ones thought process and is also a very important learning process. Avenues keep on surfacing every day to explore the best place to harness to ones creativity. At the turn of the first decade in the 21st century Photographic imagery has taken a very volatile yet viable and instantaneous world of networking. E-world became the place for the networking of minds and genre. Sites like the Facebook, Orkut, Tweeter and Flicker became a household name in urban and also surprisingly in rural areas, crisscrossing across caste, creed and financial status. Life became beyond dot-com. Today every individual feels at a loss without access to the Internet world and connecting to people worldwide, virtually and beyond. Collaboration of intellectual minds has surfaced and the world has become yet another smaller place and the space has been seized by the Information Technology boom and the comforts and discomforts associated with the use of this expressive medium. This networking however has become a dynamic space for sharing photographic work with similarly working people around the globe. Share to learn, learn to share. Innovative and creative people work on a common interest from the dragonfly to space invasion, to landscapes and to any other subject on earth. A close-knit team collaborates with each other with critical appreciation at every upload and a mutual teaching learning takes place in the virtual world. Networking has become an obsession with the Netizens of the 21st century. The art world has also been highly motivated with the accessibility to the e-space on any domain. Today interior and far flung places actually do not exist or cease to exist very soon. Human life and living is monitored with the steep developments in the e-world and the mantra today towards the development in IT is ‘SPEED’. The world is in reality becoming a truly fast paced and free spaced, free from all inhibition. It has been moving very steeply towards the pinnacle of time and space mingling with human minds of varied culture; interact with efficiency, convincing belief and empathy, moving from the niche of antiquated traditions and moral values to a more multi-dimensional and ever-growing world of competency and endurance. References Courtesy: Wikipedia, Better Photography, Photography by Phil Davis. Anutosh Deb, graduated in Fine Arts (Applied Arts) from Maharaja Sayajirao University of Baroda, Gujarat in 1989. He is presently working as an Art Teacher with Kendriya Vidyalaya Sangathan, posted at Guwahati. He has been associated with the Gauhati Artists’ Guild for about three decades and resides in Guwahati, Assam India. 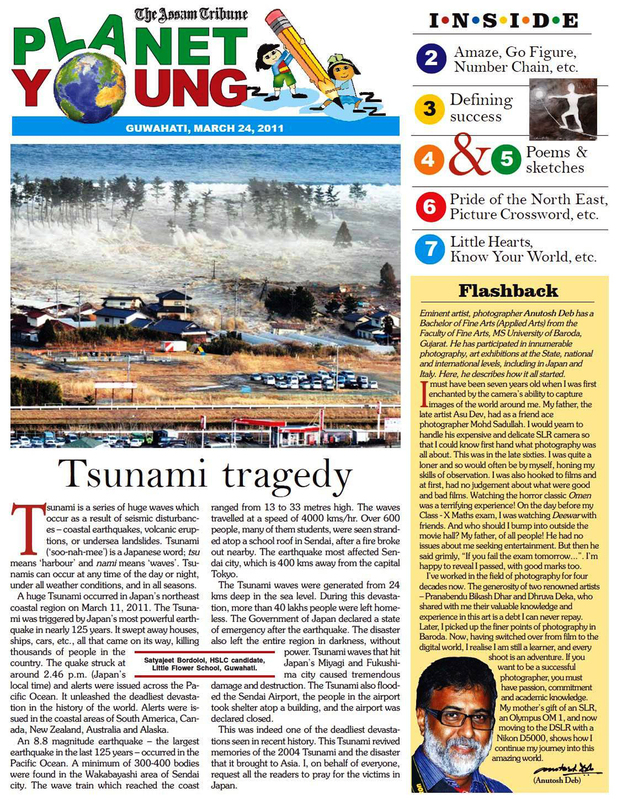 The article was first published in the Gauhati Artists’ Guild’s 31st annual Art Journal edited by the author in 2011. Also published in the School Magazine 2012.